Happy Kitchen Sink Stamps Monday, I'm so glad you stopped by today! The weather here is still super hot, and I came home from vacation to find a few of my flowers had died from the heat. It rained a ton while we were away, but the heat has taken it's toll on my perennials this year. 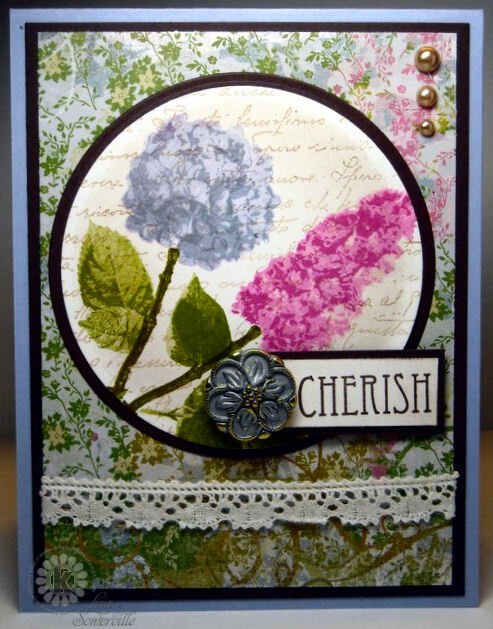 Inspired by Card Patterns Sketch 76, I created the following card, using Kitchen Sink Stamps Vintage Words, 3 Step Hydrangea, Multi Step Lilac and 3 Step Letters from the Past. The Script from 3 Step Letters from the Past is stamped in Caramel on Vanilla card stock, then cut with the Spellbinders Circle Die. Using the Wisped Frames Technique and Soft Suede Ink, I added color to the circle panel, then added the stamped Hydrangea and Lilac. Beautiful card! 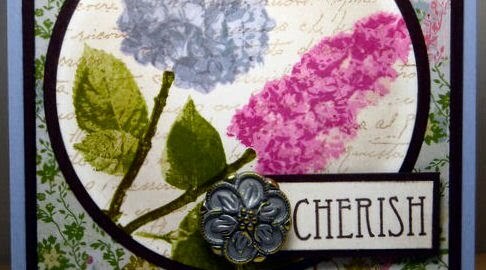 I love the colors you chose to accent your stamps! What a gorgeous card!!!! I love everything about this card! So sorry to hear about your "real" flowers!!! Hope you had a wonderful vacation!!! This is just so pretty and vintage looking, Lisa! I just love how you stamped the word image in the background!! Love this fabulous mix of hydrangea and lilac!! What a beautiful creation, Lisa!! Super gorgeous, Lisa!! The colors of the flowers are so beautiful. Fantastic design as always! What a totally gorgeous use of those wonderful stamps. The color combo you came up with is great and nice use of the sketch too. beautiful colors on this! Our flowers/grass is dead from the heat this year, we gave up on most of it. Beautiful! Really like how the colors pop off this card! LOVE your gorgeous flower cards from KS! Beautiful colors and lovely coordinating background paper.